Sonoma County Plein Air Paint Out June 20-23 – Ready Set Sketch! The Ready, Set, Sketch Group in Conjunction with The Healdsburg Art Atelier Presents: Sonoma County Plein Air Paint Out – A Four Day, Plein Air painting event and Wet Paint Gallery Show! • Join in four days (June 20-23) of painting/sketching fun around Beautiful Sonoma County. • Mingle with other like-minded artists. All Experience levels welcome! 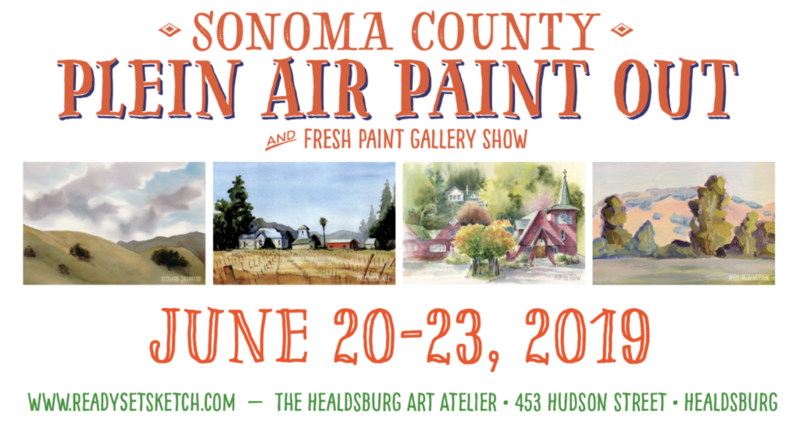 • Participate in the fresh paint gallery show with Reception June 23 at The Healdsburg Art Atelier. • Participation is free but Registration (on eventrbrite) is required and space is limited. • *Optional* “Sketching Out-of-Doors for Beginners” class (taught by me, Richard Sheppard) offered June 15 in Healdsubrg, CA (separate registration and fee required). • Register on eventbrite (only 50 places available). • There will be no instruction during the event (an optional class is offered the weekend before the paint-out). • Locations will be selected and emailed to participants in May. • Participation all four days is not required but if you feel you’ll miss more than two days, please let another artist who will attend more days sign up. • Each day we’ll meet at the designated location at 9:00am. After a meet-and-greet, we’ll head out to paint. At 3:00pm we’ll return to the original meeting place to share the day’s work. We’ll wrap up about 3:30pm. • On Sunday, after our daily painting, we’ll gather at The Healdsburg Art Atelier to set up for the evening’s “Wet Paint” show. • Reception 5pm-7pm, Sunday, June 30. • Since this is an impromptu, wet paint show, no work will be framed. • Each artist can select 1-2 of their new paintings to exhibit. Watercolor paintings will be carefully taped to the wall for viewing. Other work may sit flat on tables, etc. The public will be invited to the exhibit. • Artists will price their own work. All sales are final and will be handled through HAA with a 20% commission to the gallery. Previous Previous post: Ready, Set, Sketch: Petaluma Sheraton!